Naples of modern day shows all of the signs of it's long history. Listening to the language and looking at the remnants of lost civilisations, the buildings and architecture, remind you of the long traditional history of this city. Naples was originally a Greek colony founded by sailors coming from Rhodos. It was a merchant colony which they called Parthenope and was situated on the island of Megaride. Assuring courteous service and quality amenities, the Best Western Hotel San Germano Naples prides itself as an ideal location for business and leisure travellers. Located at the downtown in the green quarter of Agnano, the Best Western Hotel San Germano is close to the stadium, horse racing and NATO headquarters. The hotel is only a 15 minutes drive from the city centre and 20 minutes from the airport. All the 105 guestrooms are completely equipped and furnished with high standards of amenities required for a pleasant stay. You can start off your day with a nutritious breakfast and later, enjoy a delicious palate of Japanese cuisine served in a buffet style at the in-house Le Acacie Restaurant. The Best Western Hotel Plaza in Naples is located only two kilometers from Capodichino Airport, in the historical center of Naples. 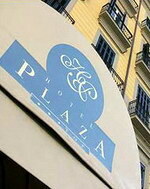 The hotel is situated at the back of Piazza Garibaldi and only 200 meters from the central railway station. The hotel is housed within a 19th century building, which has been recently refurbished and upgraded. The hotel has been completely redecorated and equipped with new furnishing in the common area and the guestrooms. The result is a refined and comfortable setting, convenient to the business district. All of the recently refurbished guestrooms at the Best Western Hotel Plaza have been sound-proofed, air conditioned and furnished for comfort. The Best Western Hotel is convenient to fine dining, shopping and entertainment venues. Wireless Internet access is complimentary throughout. 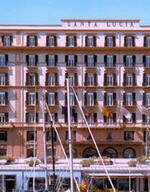 The Grand Hotel Santa Lucia is located in Naples, Italy, 10 metres from the Castel dell'Ovo, 1 kilometre from the Royal Palace, and 2 from Naples city centre. Naples' main train station, Piazza Garibaldi, is situated 3 kilometres from the hotel. Offering panoramic views of the Bay of Naples and Mount Vesuvius, the Grand Hotel Santa Lucia occupies a palatial Art Nouveau property dating from the turn of the century. The hotel opens to a sumptuous lounge area characterised by ornate mirrored walls, chandeliers, and rich fabrics, and houses the Il Pavone bar with its striking blue decor, stucco moulding, and marble columns. The multilingual concierge is on hand to offer sightseeing assistance, and further amenities include 24-hour room service, an Internet point, and laundry facilities. Guests of the Grand Hotel Santa Lucia can start the day with a complimentary buffet breakfast and enjoy Neapolitan and Mediterranean dishes in the restaurant. 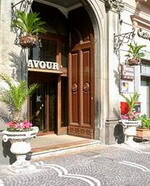 The Hotel Cavour is located in Napoli near the historical center of Naples, only 2 kilometers from the airport. This cozy, 19th century hotel has been carefully renovated to retain its original charm and provide modern comforts, as well. The hotel is situated right off the Piazza Garibaldi in the heart of Naples, convenient to the city's historical attractions. This hotel is prepared to meet the needs of the business traveler, as well as the tourist. A complimentary buffet breakfast is served every morning. Wireless Internet access (surcharge) is available throughout the hotel. The hotel has an exceptional restaurant onsite, serving French-influenced cuisine and the hotel also has French-style bar in its lobby. The hotel has a multilingual staff and is able to provide information and suggestions for tourist excursions. With its central location, the Hotel Cavour, Napoli is just steps away from fine dining, shopping and entertainment venues. 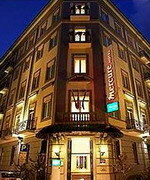 The Hotel Mercure Napoli Garibaldi is housed in a five-storey period corner property and is located 500 metres from the historic centre of Naples, Italy. Multilingual staff at the 24-hour front desk can offer the use of a safe-deposit box and limited hours room service is available. The air-conditioned public areas have wireless Internet access (surcharge) and complimentary newspapers are available in the lobby. The hotel also has a lounge bar. Neapolitans are justifiably proud of their cuisine; look out for Parmigiana di Melanzane. This is sliced aubergine cooked with cheese, garlic, oregano and tomatoes. Delicious. 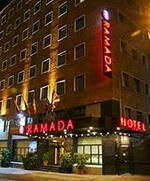 The Ramada Naples, located 5 kilometers from Capodichino Airport, is a new and modern hotel located in central Naples. 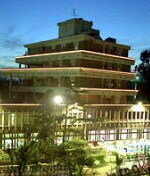 The hotel is situated by the main business and shopping districts. The town's many historical sites and the central station are within easy walking distance, making the hotel an ideal base for business and leisure travelers. The Ramada Naples also boasts a comfortable, efficient American bar and a spacious restaurant. The restaurant can efficiently organize quick working lunches or serve tasty local and international culinary specialties. The Ramada Naples is convenient to dining, shopping and entertainment venues.